It might have been written a hundred times, easily, on that enormous face. Humpty Dumpty was sitting with his legs crossed, like a Turk, on the top of a high wall--such a narrow one that Alice quite wondered how he could keep his balance--and, as his eyes were steadily fixed in the opposite direction, and he didn't take the least notice of her, she thought he must be a stuffed figure after all. 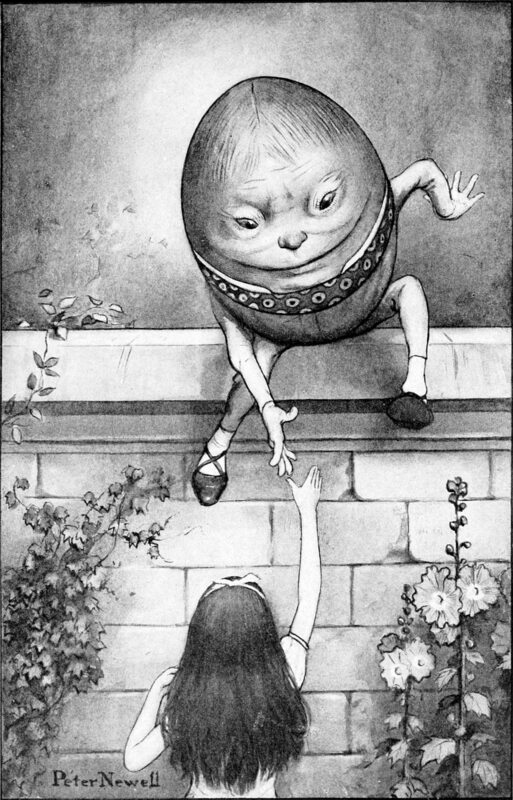 Humpty Dumpty took the book, and looked at it carefully. 'That seems to be done right--' he began. Alice waited a minute to see if he would speak again, but as he never opened his eyes or took any further notice of her, she said 'Good-bye!' once more, and, getting no answer to this, she quietly walked away: but she couldn't help saying to herself as she went, 'Of all the unsatisfactory--' (she repeated this aloud, as it was a great comfort to have such a long word to say) 'of all the unsatisfactory people I EVER met--' She never finished the sentence, for at this moment a heavy crash shook the forest from end to end.